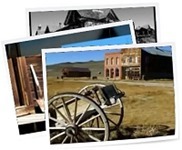 Images of Bodie residents and those connected to Bodie. www.Bodie.com Stage coaches drawn up in front of the Grand Central Hotel. www.Bodie.com Inside one of the many saloons in Bodie. Bodie's baseball team - 'The Mutts'. A few of the players have some denomination of paper money on their knees, and most have a coin or token on their caps. Many mining camps of the era had baseball teams. Bodie's field was at Booker Flat. Inside the Bodie Bank sometime after 1890's. Mill workers standing on top of a shaft. Or, click here to see all images tagged as “people”.